When I read a technical paper written by an author from whom I have not read anything before, I usually find that I have the biggest problems not with mastering the intellectual challenges that the paper presents, but with understanding the author’s terminology and relating it back to concepts with which I am familiar In this context, modeling is a notoriously difficult subject since it is so utterly interdisciplinary. It is therefore one of the major goals of this text to introduce a variety of different modeling concepts (terminologies) and relate them to each other. 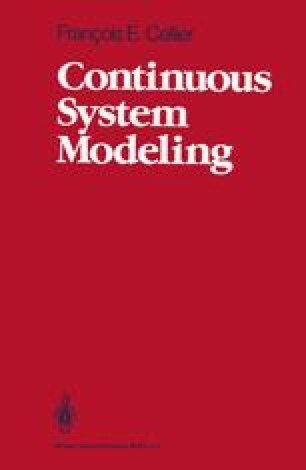 In this chapter, we shall discuss several graphical modeling techniques among which, in more detail, the bond graph modeling technique has found widespread acceptance and use among a number of modelers from several application areas, particularly mechanical engineers. We shall see that bond graphs are very easy to relate back to previously introduced concepts, and yet they are somewhat difficult to read on first glance.